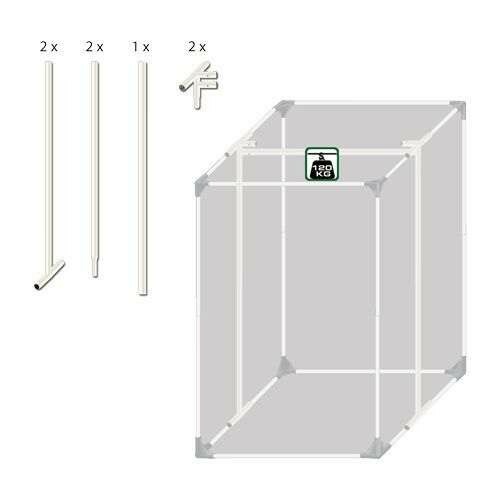 Choose the Hercules Frame support that coincides with the size of your GrowLab Portable Grow Room. By simply sliding this accessory over the existing frame work you can easily add strength where you need it. It has the ability to put cross members in a high or lower position allowing you to criss cross 2 Hercules Frame Supports adding more strength exactly where you need it! Each Hercules Frame Support is a complete kit which will go from floor to ceiling across the roof of the tent and back to the floor. Need to hang a giant carbon filter and some 8" Magnum XXXL hoods in your Growlab… consider the Hercules Frame Support!